Hawthorn is an effective drug for heart failure, arrhythmia, and circulatory disorders. Additionally, lowers blood pressure and even prevent heart attack or angina pectoris .. Familiarize yourself with the healing power of his graceful flowers ..
Hawthorn with us occurs quite frequently. We'll find him on the slopes, on the edges of woods, parks and gardens, or on the edges of meadows. Hawthorn has the shape of a tree sometimes, other times it's branched shrub with sharp thorns. Right now, in May, the time of flowering, when we meet him in nature, it certainly notice. Be alert to each typical, not too sweet scent, but rather that it is mostly straight and wrapped laden swim medicinal flowers. In pharmacies and specialized stores today we get a wide range of products from hawthorn, both in the form of teas, and tablets, capsules, tinctures and the like. Whitethorn however, we can easily collect and dry yourself. 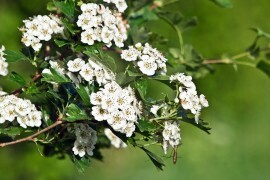 The harvest is usually recommended only white-flowered hawthorn, some sources report, and pink blooming hawthorn has the same medicinal effects. Personally, I collect only white flowers. The flowers are harvested so that their whole tiny grapes odštipujeme and shank of twigs, leaves admixture connected mind. Susie is a thin layer without turning, rather just naturally in the shade or in a well ventilated room, drying in the oven and dryer should not exceed a temperature of 35 ° C. Store the drug, then dried in a hermetically closed container away from direct sunlight. Medicinal effects are the leaves and fruits of hawthorn (haw called), but not as pronounced as the flower. When harvesting fruits should also check if there are insect infestation, sometimes because they are "wormy". Hawthorn is a known natural remedy for the treatment of heart problems and circulation problems. Its effects are really worth our attention, action hawthorn is also recognized by many doctors also recommend it as a supportive adjunct therapy. Substances contained in hawthorn have a stimulating effect on the heart muscle and its blood supply, improve the patency of arteries and blood vessels and improve overall blood circulation throughout the body. Acts as a pressure regulator, in particular for high blood pressure, which effectively reduced. Hawthorn is the right herb, if we suffer heart failure, arrhythmias and circulatory disorders. It works well as prevention and treatment of angina pectoris, it is recommended for prevention of heart attack and recovery afterwards. Hawthorn also has a soothing effect, which can be used for example in the case of insomnia, or at the time of a strong nervous tension and long-term stress. It also helps women in menopause, which reduces unpleasant conditions. When used as a medicine hawthorn is very important perseverance and patience. Desired effect is the result of regular and prolonged use. Hawthorn great advantage here is that unlike many other herbs with the effect on the heart and blood circulation, it is not toxic, not with him no known negative effects, the only problem might be contraindications with other medications. Depending on the severity of heart trouble and blood circulation, and in case of the use of powerful synthetic drugs or herbs (such as digitalis), with its application to better advise your doctor. How best to use hawthorn blossom? Hawthorn can be used either alone or added to dried flower herbal tea blends. Of hawthorn tea has a bitter taste, but to you soon get used, respectively. your tea sweetened with honey. I hawthorn combining with other herbs improve on the overall taste of the tea infusion, suitable as mint, lemon balm, and yarrow. Hawthorn can also add to the mixtures to detoxify the body, to alleviate menstrual discomfort, as already mentioned above, good for women in menopause. Recipe for tea / infusion of hawthorn: 1 teaspoon dried drugs pour 0.2 liters of boiling water and let stand for 5 minutes, strain. The effectiveness of action we use 3 times a day.